I finally purchased a pair of clogs (for my Bday) so they are featured in my pics, I love the detail on the top:) I chose black because I wanted to be able to wear them both in winter and summer. They are really comfy as I have taken them for a test drive a couple of times! Happy Friday everyone and have a fantastic weekend. Love the clogs AND the ring. LOVE the clogs and ring!!! AM-A-ZING clogs dear, u look fab. Love the patterns on the clogs and the shredded jeans! love your HUGE ring!! the jeans are super cool too. 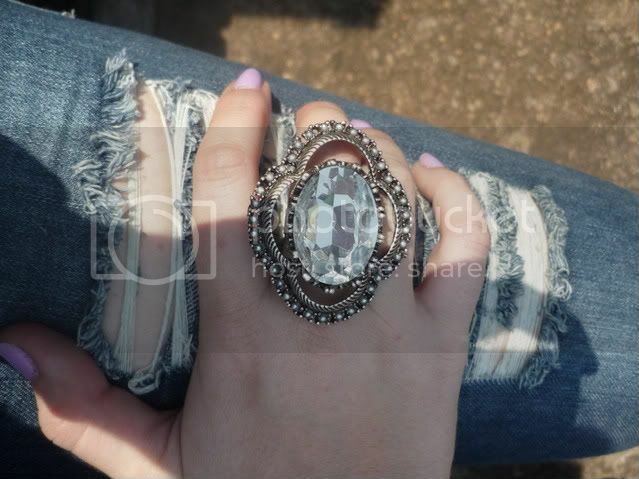 great ring and also like your nail polish! hy girl i like your blog, and i follow him. PS: the ring is amazing!